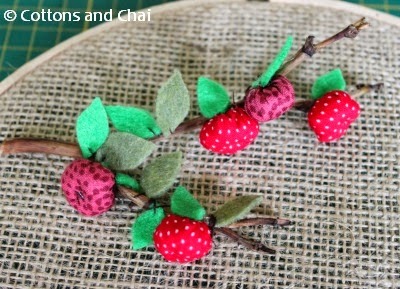 We're adding this post to this week's Sew Darn Crafty Linky Party! This last Labor Day in Minneapolis was great fun - we attended the incredible Minnesota State Fair full of rides and foods and a sea of people as far as the eye could see. In short, it was a party-on-a-stick! And then we went apple-picking with some friends. My little one went right about it and we came home with enough apples to make half a dozen pies. 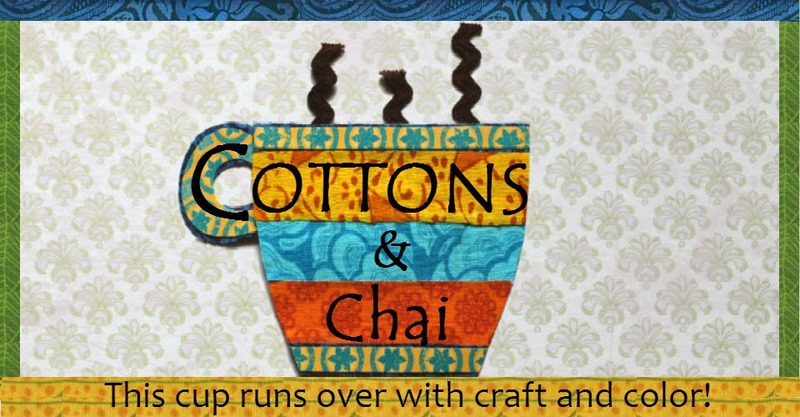 (Not to mention the exceptionally refreshing apple cider!) The hay ride took us all around the orchards and farm - row upon row of apple trees bursting with fragrant fruit and scattered patches of pumpkin with curling stems. So in memory of our beautiful morning spent among apples and pumpkins, I made this Fall decor piece to put up on our front door. 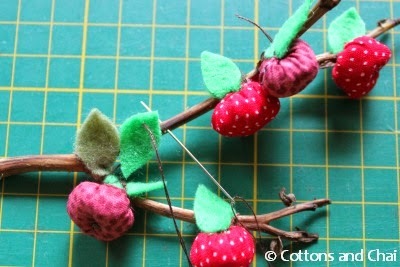 Only hand-sewing needed for this one! 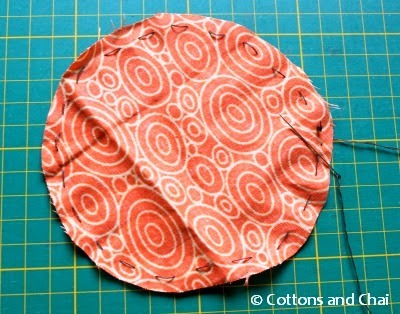 I rummaged through lids in my kitchen to find a circle appprox DASH DASH inches in diameter and cut it out of some orange fabric. 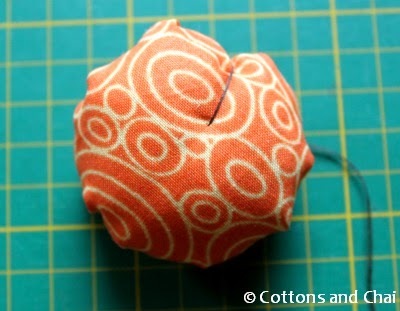 Then I did a running stitch all around the edge of the circle. 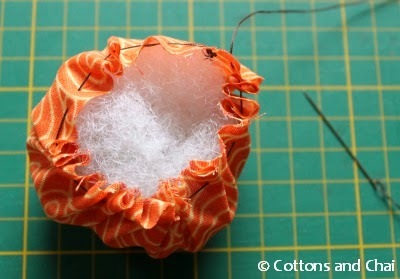 Next I took a small ball of polyfill (about the size I wanted the pumpkin to be) and stuffed it in, while pulling the thread in. 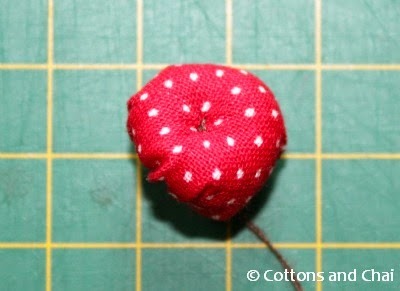 I went with the thread over the side of the ball and back to the gathered top through the center of the bottom. 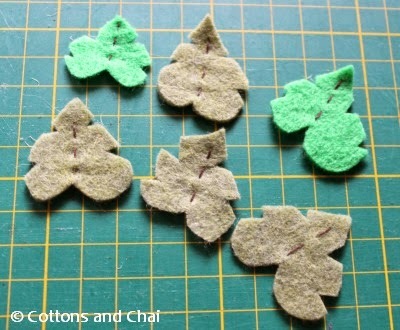 Then I cut a leaf shape out of olive green felt and attached it to the gathered top with a running stitch that doubled up as veins. While I was at it, I went ahead and made a yellow pumpkin, this time with a circle with diameter about 1 inch smaller than the first one. 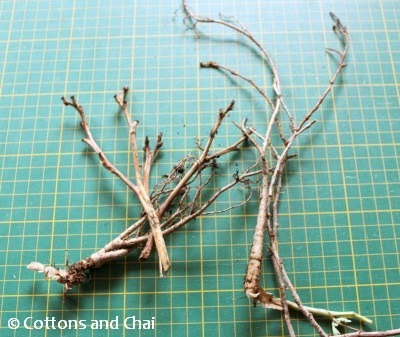 At this point I went out to forage around for some small twigs, which I quickly found and brought back. 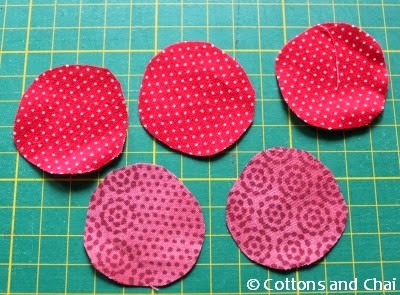 Now on to the apples - I cut a few circles (they need to be significantly smaller than pumpkins) from apple fabrics. I did the same thing as with the pumpkin, except that I made a teeny cross on the underside to give it that little bump at the bottom. 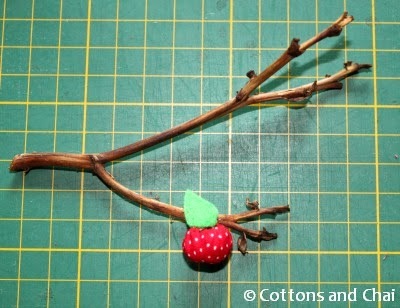 Next I chose a nice branch-looking twig, cut a small leaf from felt and attached the apple to it by making little stitches. 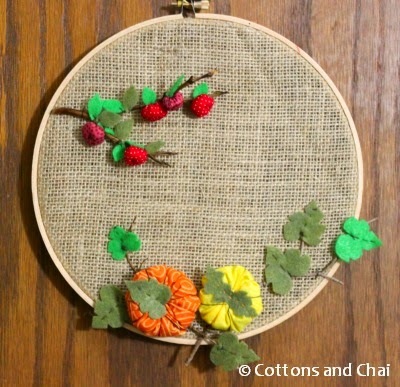 Then I stretched the burlap over the embroidery hoop and after trimming the burlap all around the back, I tacked the apple branch onto it like so. 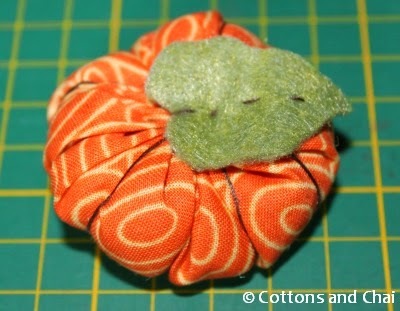 I did the same with the pumpkins and their leaves and voila! Here it is hangin' up on our front door.